We’re nearing the end of the season, right? Wrong. Let’s take a look at how March is shaping up in Colorado. 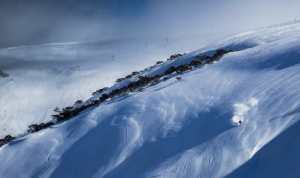 March generally signals the beginning of the end for Northern Hemisphere ski seasons. The usual script says that as days get longer, the snow starts to melt, runs become icy, and prices for accommodation and lift passes finally start to drop. But 2017/18 has not been a season to follow any sort of script. In fact, it’s more likely to be known as the year that tore up the script books, used the pages to wrap old fish and chips in, and to try barter that soggy battered hock for fresh salmon sushi rolls at the powder-laden Japanese resorts. As we all know, snowfall for most resorts in the west of the US (that is, California, Colorado and Utah) has been below average this season, thanks to a La Nina weather pattern that drove snowfall further north and east. La Niña is the system we have to thank for the mammoth seasons that resorts have been experiencing in the north-east of the US, and causing iguanas to fall out of trees in Florida. 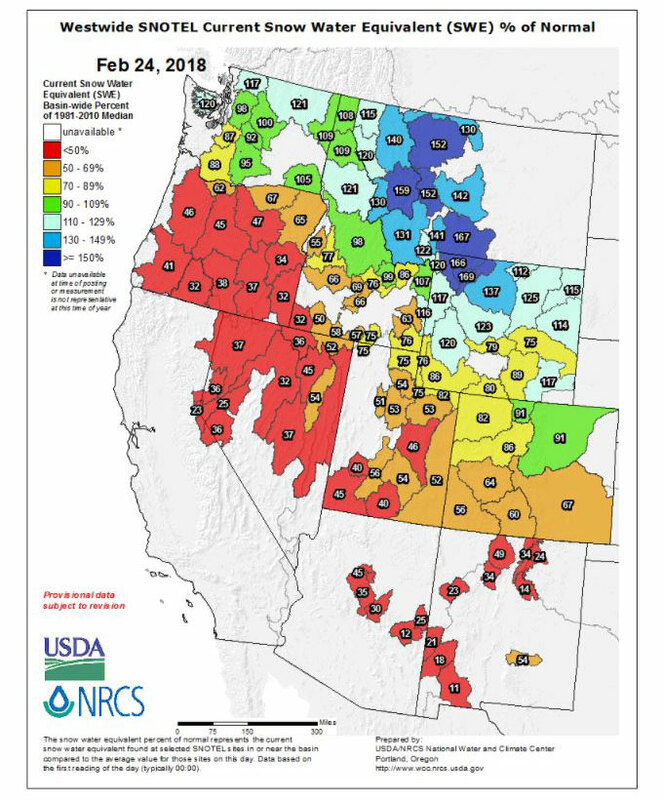 Meanwhile Colorado snow depths were sitting at less than 60 per cent of their average in many places in February. At Telluride in southern Colorado, the snowpack was closer to 40% of its depth from the same time last year. But just as we thought the soggy, snow-desperate western slopes of the US couldn’t look any more dire, a legion of late storms have rolled through Colorado, California and Utah. 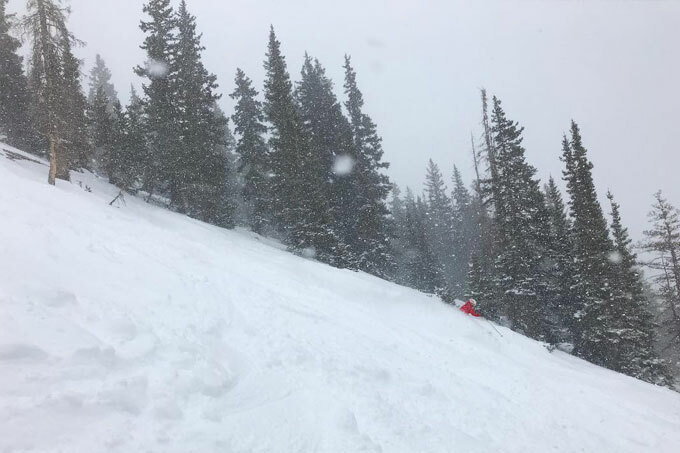 At least five storms have hit Colorado since mid-February, dropping up to 30 centimetres at a time in places like Steamboat, Vail and Aspen. Colorado resorts have copped consistent powder poundings, bringing their snowpack totals back up to the average depth for this time of year. As you can see from the below graph by US national weather centre SNOTEL, snow areas in the north-eastern corner of Colorado (coloured in light blue) are now sitting ABOVE average (at 90-109 per cent) for the end of February. 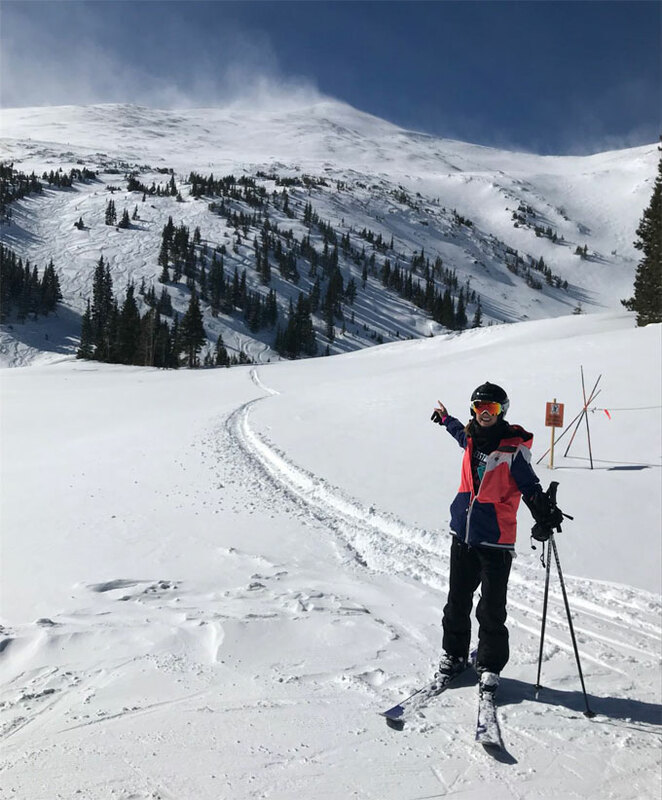 I visited Breckenridge and Keystone in mid-February, just in time for a two-day storm that brought at least 20 centimetres of snow to the groomers on the 15th and 16th of the month. While the official reports recorded six inches in 24 hours, I can attest to the fact that many of the off-piste bowls were loaded with waist-deep powder by the time they re-opened after avalanche testing. Here are some fuzzy iPhone shots of me testing the depth in Breckenridge’s Serenity Bowl off Peak 6. 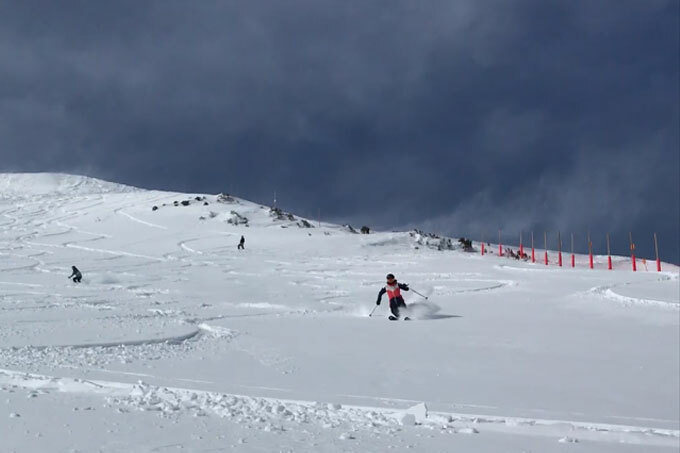 Kate, finding some freshies in Breck’s Serenity Bowl. As an aside, this was my first visit to Breck and I found most of the negative rumours about it to be unfounded. You’ll hear that it’s cold, icy and packed with crowds due to its proximity to Denver. 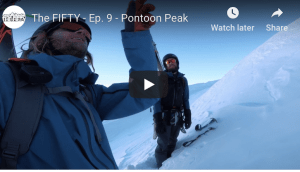 Apart from the cold (it is pretty fresh at the 13,000-foot peak) these stories must be a stab by locals to keep travelling powder hounds at bay. All I found was incredible backcountry hikes, wind-blown powder and immaculate groomers – with very few people skiing off the main runs. Since my visit, Ullr has been rewarding Colorado skiers with regular top-ups. 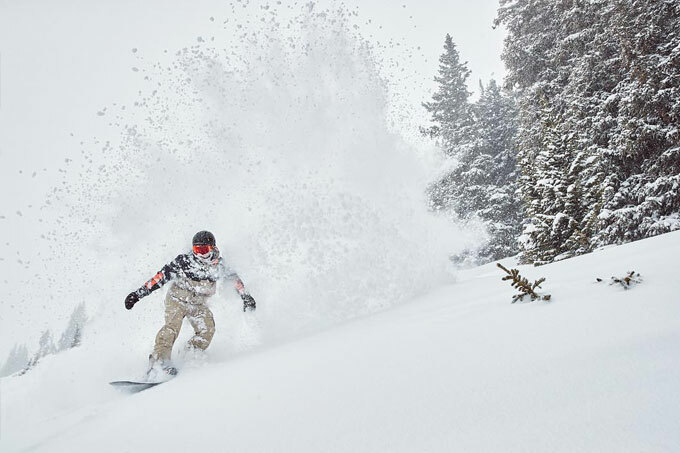 Vail scored 20 centimetres of fresh stuff on 21 February, and Breckenridge posted this drool-worthy video to its Instagram account. Warning: may induce feelings of itchy ski legs and extreme anxiety to book a flight to Denver, stat. The forecasters say snow will keep coming and Colorado meteorologist Joel Gratz is predicting a widespread storm that will dump 10-20cm of snow on all resorts this Sunday evening (keep your eyes on the cams on Monday at midday Australian time), then two more potential storms between March 9-12. These storms are pitched to be widespread, with models showing up to half a metre for the week ahead in some Utah resorts (Snowbird’s Instagram story claimed 75 centimetres in the next five days). Kate Allman, excited for a blue bird day with fresh snow. If you were to go ahead and book a flight to Colorado right now, you would likely get your money’s worth. In fact, speaking of money, the only part of the standard snow season script that Colorado has chosen to follow this year is to drop the prices in “shoulder season”. 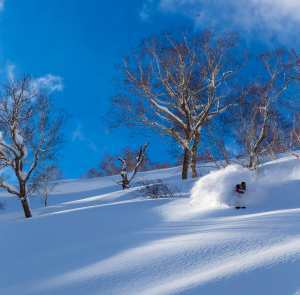 All Vail Resorts are holding a 96-hour Spring Sale, with 40 per cent off accommodation if you book by March 2 (March 3 for Aussie time zones). The prospect of booking a last-minute trip to Colorado in March is a wacky idea, but we have already established that this is a last-minute, wacky season. 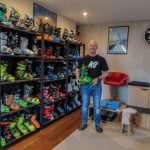 The accommodation sale makes the idea even more enticing for Australian Epic Pass holders, who don’t need to pay for lift tickets at Vail Resorts. All I can say is well played to all the savvy travellers who rolled the dice and booked Spring ski trips to the west of the US this year. 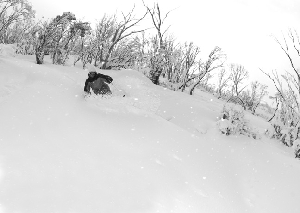 Looks like you’re heading for the best conditions of the season.